Hey everyone, it's Lisa's assistant Jessie. You may have received a similar greeting in an Etsy convo recently, followed up with "I swear we didn't forget about you, your order is coming, we just weren't expecting for Neil Gaiman to link to the shop and get so slammed with orders that we're just now getting to the order you placed on April Freaking Tenth." The Poppet business is booming, and because Poppet Planet is currently a two-bit operation and everything we sell is hand cast or hand sculpted and hand painted and hand licked kissed on the face by Our Artist, we have quite a bit of actual nose to the grindstone work to do pretty much round the clock. I want to tell you a little bit about the process of making Poppets just in case you ever felt disappointed when you opened your mailbox a week after placing your order and still seeing no sign of a cheery package from Palm Springs. Also, this will explain why Poppet says "read our shop policies," which kindly remind you to convo us immediately to tell us if your order is a gift so that we can make arrangements to get it to you in time. Don't make Poppet tap the sign. 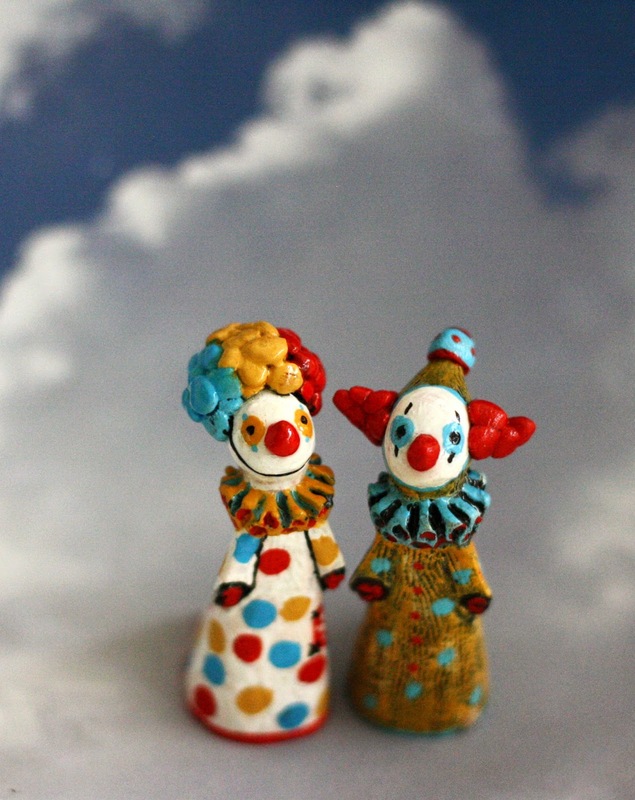 Poppets are cast in resin and marble dust, or they are hand sculpted by the artist. Yeah, by the artist. As in Lisa. As in they are not outsourced or made by the hundreds in a warehouse or even passed off to Jessie to perfect. Hand Sculpted Poppets are indeed made with Lisa's hands. 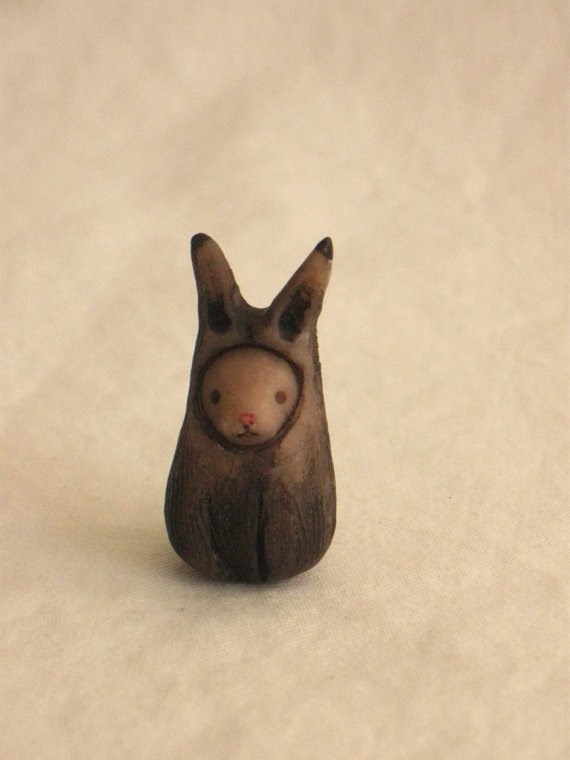 They start as lumps of polymer clay. Our Artist fashions them into various sized balls for each piece of the poppet. This includes one large "gumball" sized ball for the body, a "marble" for the head, three "blueberries" for the two arms and the rough, and two little "BBs" for the hands. Lisa provided me with a "Poppet Parts Chart" for reference, as I will on occasion, as her lovely assistant, roll hundreds of tiny balls that are ready for her to just pick up and sculpt. This saves her some time, but after having sculpted many many many poppets in her days, she can whip up these balls to their correct size with no problem. Still, if I can save even two minutes of her time, I will. The balls are then formed into their various shapes--which if you have not noticed, are all pretty much teardrops. Look at your poppet. Can you count the teardrops? Some of the more elaborate poppets are only hand sculpted once every few weeks, as we have discovered a bit of a time saver. 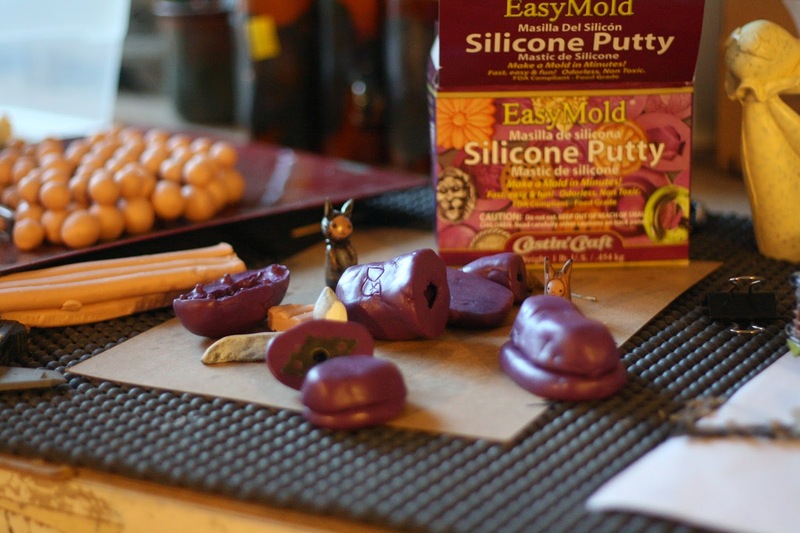 After Lisa sculpts, say, Poppet On Tour, we make a mold of it. The molds don't last forever, but if we can get 30 poppets out of it before it begins to deteriorate, it's worth it. 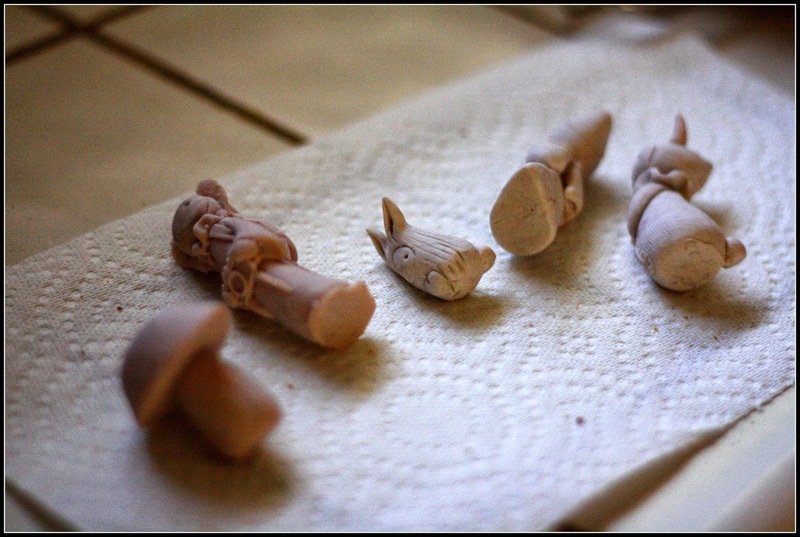 Making the poppets via mold isn't just a lickety-split cookie cutter process though. The poppet will come out with "flash," where the seams of the mold come together and squishes where the clay comes out of the sides and creates a sort of "extra skin." 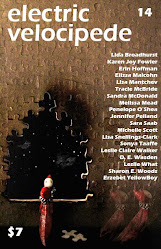 Lisa takes her trusty X-Acto knife and cleans it up, and adds back any delicate detail that was lost in handling. Now, that's just the hand sculpted poppets. 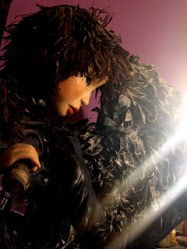 When it comes to the Classic Poppets, pieces such as An Angel Named Grace, A Child's Garden, Piper the Gnome, or those big wonderful garden sculptures, it requires goggles and a trip to the garage. More often than not, Lisa is the one doing the marble casting--which is a complicated sciencie process that I do not fully understand. There's measuring and mixing and timing and that's not really my thing, but she is training my delicious man friend Willie Dean all of the sorcery that goes into the process. The liquid form of a poppet is similar to the same texture you get when you add milk to your ice cream, or like a well blended cottage cheese. 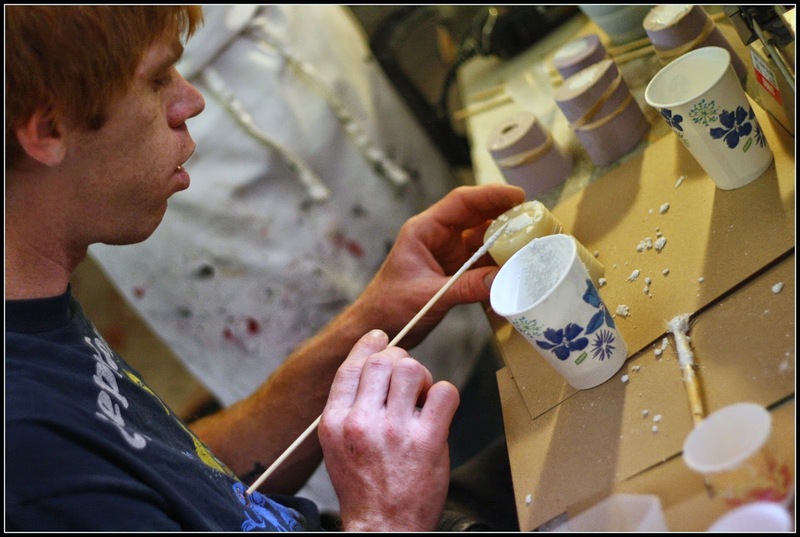 It is poured into molds (molds that were created by Lisa, that were created from hand sculpted originals) and left to sit for some certain magic amount of time. There's some kind of bass-ackward nonsense about the time being shorter for larger pieces because the chemicals heat up when they react, and with more material there is more heat and it cures faster. Don't hold me to any of this information though. Like you, I just see the finished product and go "yay!" But I do know that there is a lot of frustration with too chunky of mixes or spoiled batches of whatever, so we're not exactly talking about some easy cheese science here. It's Grandma's scratch brownies with real vanilla extract compared to the Betty Crocker mix. It's gotta be exact for it to come out right. You can't just add an egg and expect it to be as good. At last, that familiar little totem is popped from the mold, and we have that clean little doo-dad. It may need some cleanup, like the one in the picture here that needs some sanding on the bottom. And because of the marble, you might notice little "freckles" on Poppet's face. We're starting to leave these because they're kind of cute! It's just the grain, but it adds character. Some poppets are very freckly, though. I am not with Lisa at all times, I do not know exactly how many poppets she casts in a week or a day, but I can tell you that last Tuesday Willie cast about 30 figures that included some poppets, some rats, and some other random things that he found molds for--some things that pre-date Poppet that you've never seen before. Wow, 30 figurines though! That's a lot, and all within about three hours? He's a little poppet making factory! He's a machine, that Willie Dean! 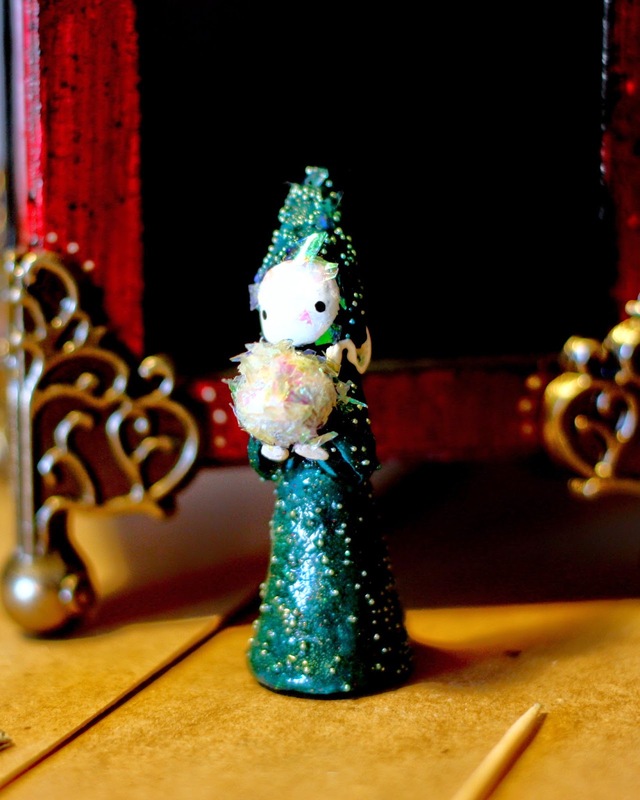 Every Poppet, whether cast or sculpted, is painted black (except for its face.) The crevices of the rough, all of it. Black. And paint takes a minute to dry, as you know, so usually the body is painted first, and when the paint is dry 10 or so minutes later, the head is painted. When all of the paint is dry (and the rough takes the longest because of all of the little holes) we use a technique called "drybrushing" with white. To drybrush, we dip a flat brush in the white paint, and then make several strokes on a piece of cardboard, or our apron, or whatever is handy to eliminate most of the paint from the brush. Then, when the brush is mostly "dry" of paint, we make several quick strokes on the poppet, which leaves a chalky white effect that allows the texture of the poppet's robe to show through, as the white paint does not fill in the creases. A second hit with the "drybrush" is made to areas that need to be highlighted, such as the rough, or Poppet On Tour's backpack, or the little cup of cocoa and bunny slippers on the Cozy Poppet we know from winter time. This step is very important to the painting of poppets. It's what creates the unique layered look that you can observe on your poppet's robe. In fact, if you took a microscope to your poppet, you would see the white and black paint under the colors. Cool, huh? There is another painting technique that we give to some pieces called "washing." This is a technique we use on little Bibbit, for example. This is a technique where we mix lots of water with the paint and let the colored water sort of "stain" the piece. The neat thing about this is how it runs into the cracks where it is dark, and it stays light on the surface. She has also used this technique to give garden sculptures a sort of mossy patina by washing them with green. A very cool thing that happened recently was while I was being nosy and snooping through Lisa's house, I found a cache of rats. 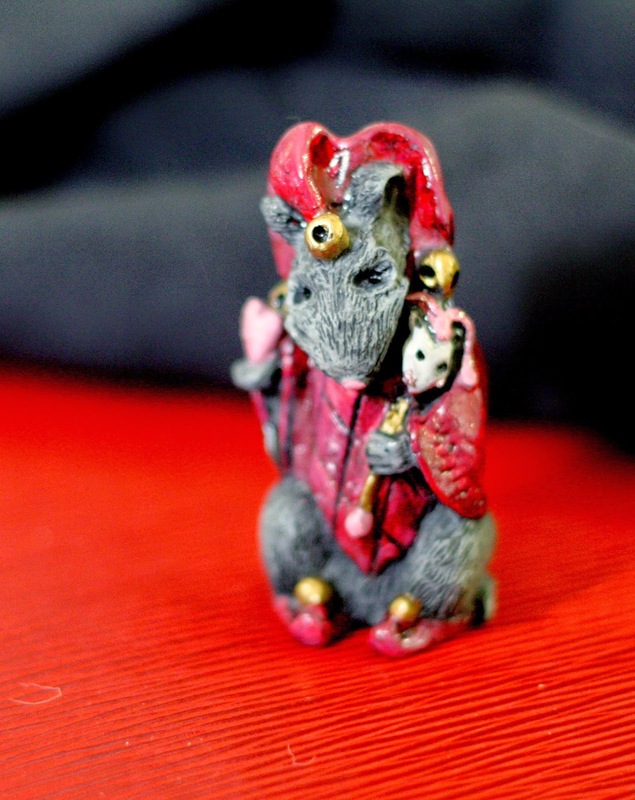 Jester rats! I brought them to her and told her I loved them and asked if there was some way we could save them from their little shelf in the dark room I was "accidentally" looking around in by accident on purpose. "Valentine Chester" was made many years ago when Strange Studios was more than just a two bit operation, and there were actual hired Poppet Painters who really did work in a warehouse in the desert. Many Valentine Chesters were painted. Many never sold. But why does he have to be only for Valentines? I get that his pink heart and cheery red robe are very Valentine-ie, yes, but Lisa came up with an idea to update Chester a little to give him a more year-round look. We put a black wash over him. The result? Chester has less of a bright red robe and more of the Alizarin Crimson color that the Classic Red Poppet wears, the bubblegum pink trim on his sleeves is darkened to a more "Lisa" sort of blacky-pink, and his fur is darkened to a more ratty sort of grey. We finished him up with a gold tooth, a touch of glitter, and a glossy coat on his fancy jester clothes, and even gave him glossy black beady eyes that make him look very lifelike. Like, he might actually be alive. I don't know. It freaks me out when it's dark and they're all looking at me. But anyway, he is now for sale. Of course, all of these fancy little bells and whistles like glitter and gloss are a glimpse into Step 4. Now we go to Step 3 with our base painted poppet. So even if a poppet is just one solid color, we're looking at about two hours of solid work before even coming to the point where we can paint it that solid color. The color is drybrushed on over the white drybrushing, but not covering up that black undercoat that the white left exposed. This can be tricky. Too much paint and you cover up your texture. Not enough paint and the white shows through. Then you've got to do the rough. And make sure that the little holes in the rough are filled in. And then you've got to touch the rough up again to cover up where the paint from the holes slopped out. And let's not forget that beautiful face. Poppet's got to have a face! If the poppet needs to have a white painted face, we paint a thin layer of white in 2-3 coats, similar to painting your nails. When the face is all painted, we take a very fine brush and paint an outline around it. And then we dot the eyes. I? Am not very good at dotting the eyes. Truth be told, even Lisa sometimes has trouble dotting the eyes. This is where the licking comes in. If an eye goes wonky, and you're quick enough, you can simply lick off the paint. No, you cannot just use your finger. Or a washcloth. A tongue is the only tool that will do. Not every poppet is licked but it happens. And now you know the company secret. Sometimes the paint sets too quick and we are beyond the licking point and have to repaint the face. Oh and yes the paint we use is nontoxic, but I think that's only for it's regular use. Probably isn't meant to be ingested. But who cares, because Art. Touch up, outline, paint the little hands and there! 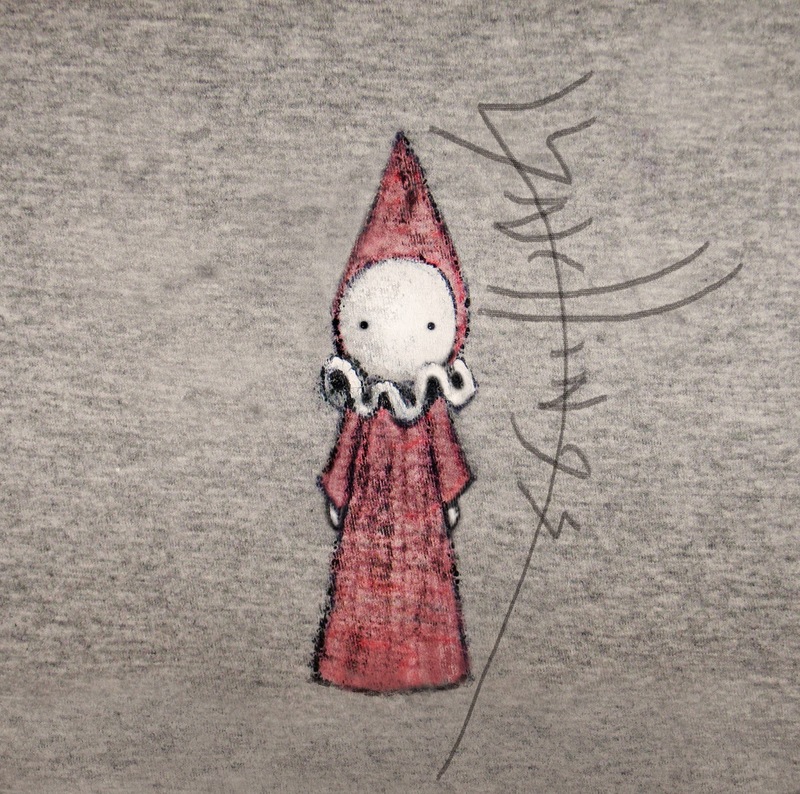 A Little Red Poppet. HA! As if all we sell are single colored poppets. Surely you jest. Surely you aren't suggesting that we don't spend hours coming up with new designs to entertain you folks so we can get sales and, you know, make a living. You're too much. Let's take a look at the shop, shall we? Oh I see this cold cast marble Day Of The Dead girl with her drybrushing, wash, tiny flowers and I won't even bring up her umbrella. Or the Pizza Chef who starts off with red for his sauce, which is stippled with yellow for his cheese, all of the outlining for the apron, pepperonis and mushrooms which all have to be painted, along with the little bell peppers, and his "sauce splatters." I won't mention his hat or that rolling pin. 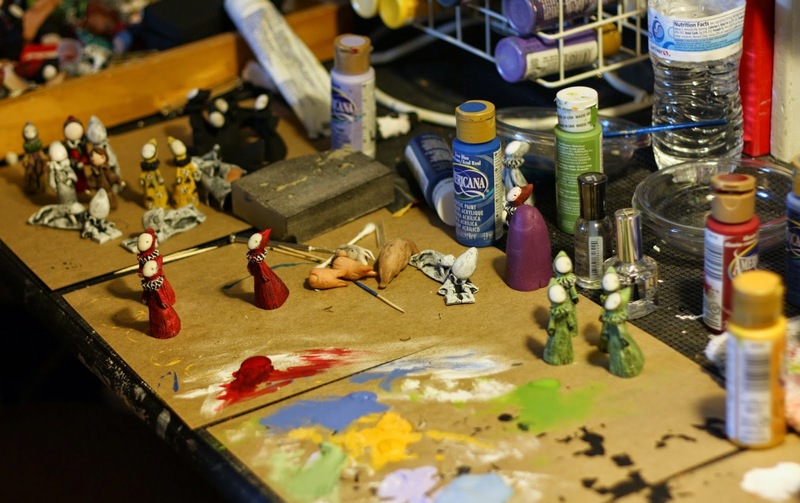 "None of this will matter when we don't have any water"
And the Mushroom Clown with it's perfectly round "face paint," all of the highly detailed Game Of Thrones poppets, and the very very detailed tiny landscape scene painted inside of Yesterday. And yes, that is a hand sculpted 3D flower in there, but I won't get to that yet. From the dots and spots on the Birthday Poppet to the frogs on the coats of the the steampunk professors, there's a lot of tiny detail on these puppies that is usually applied using a toothpick. Not to mention, everything needs an outline, so it all has to be applied twice. Depending on the detail of the poppet, this can take hours. And because it is easier to get several done at once, it takes even longer. In the end though, instead of having spent two hours on one poppet, we maybe spent six hours on 10. That's working smarter, not harder. So now do you want to talk about umbrellas, rolling pins, and 3D flowers? 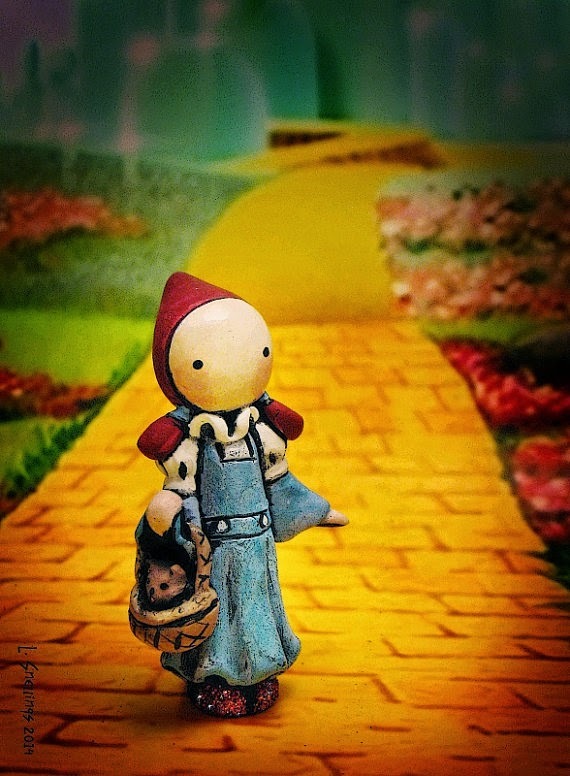 Is your favorite poppet holding or interacting with a schmancy little thingy? Does he have clown hair and a clown nose, or a mask or an umbrella or glasses or a tiny toy or a knife or anything that we didn't just cast into his little hand in the first place? You are not alone, because there are hundreds of poppets with little add ons that make them special and unique. A poppet for sale is exciting, yes. But put something in its hand or on its head, duuuuuuuuuuude I'mma need a stack of those. And we sell stacks of them. STACKS. These fancy little add ons are made by hand, or if they are a charm or a bead or something, they are usually attached by Dremmeling a hole and gluing the piece on with the help of a piece of wire. There are a few little pieces that made with an epoxy that Lisa is allergic to and it gives her big rashes on her hands. But this substance is the only substance that will do for the perfect thingy. Dedication, yo. But the thingies! They add so much! I will never forget the time that the little brass ukulele charms didn't come in so Lisa hand sculpted some so we could send off orders, and she used a razor blade to cut four tiny little strings into it. Sometimes the fanciness of a poppet is done with a hat tip to some gawdwaful funky nail polish that even a 14 year old girl will dismiss with a haughty "gag me with a forklift." 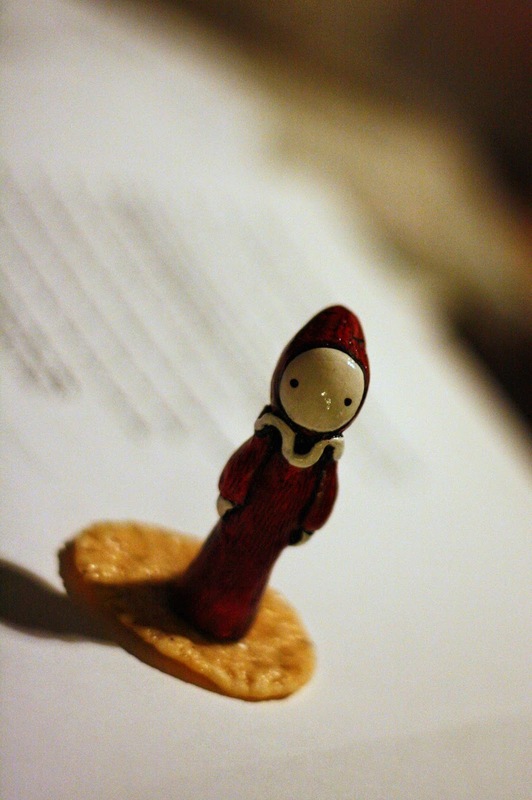 Sometimes we get bored and start gluing things to poppets, such as microbeads or candy sprinkles. I personally go overkill on glitter but everything I've put glitter on has sold so I don't think it's all that overkill, unless you're buying it because it's overkill and that's what you like about it. Finally, it's time for the finishing touches. How do poppets get their glossy coats? This is a little known secret that may surprise you. Poppets are fed a diet of raw egg and avocado with a little bit of salt, pepper, and cayenne. The protein lends to the thickness of the coat, whereas the 20 different vitamins and minerals give poppets their shine. 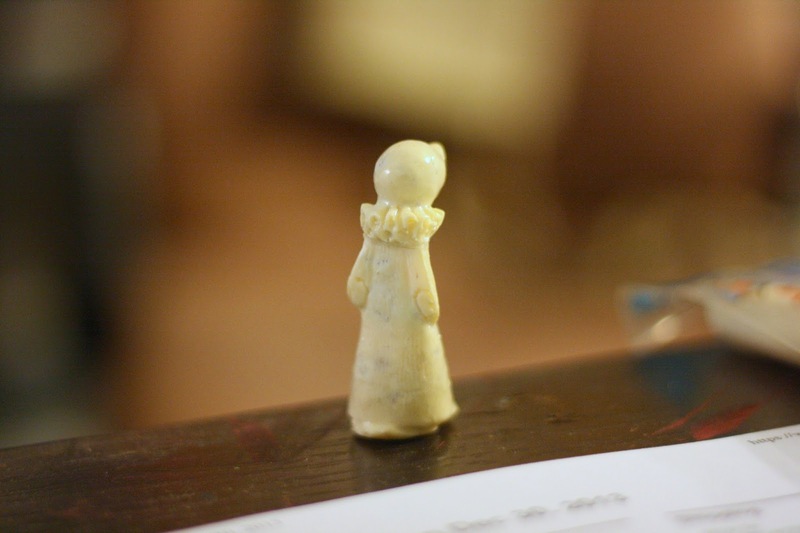 Have you ever dropped a poppet on your tile and breathed a sigh of relief when it survived without a scratch? This is due to the high cholesterol and monounsaturated fat in the poppet's diet. I'm kidding. We use clear nail polish or floor wax. Each poppet is hand finished by Lisa. She inspects every one for imperfections, touches up my sloppy work (sorry, not all of us have been doing this for 25 freaking years) and signs the bottom. Would you like this on a shirt? 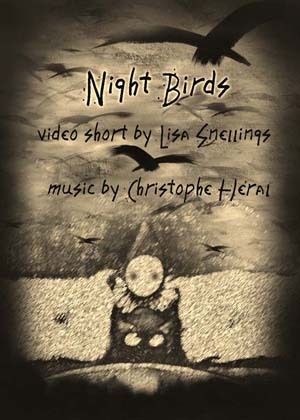 PS, did you know that Lisa's designed her signature to look like fish bones? Okie dokie, so you've now got a pretty good idea of what goes into each and every little poppet on the planet. Now, I'm just telling you about what happens between the time that you place your order and the time it is shipped out. 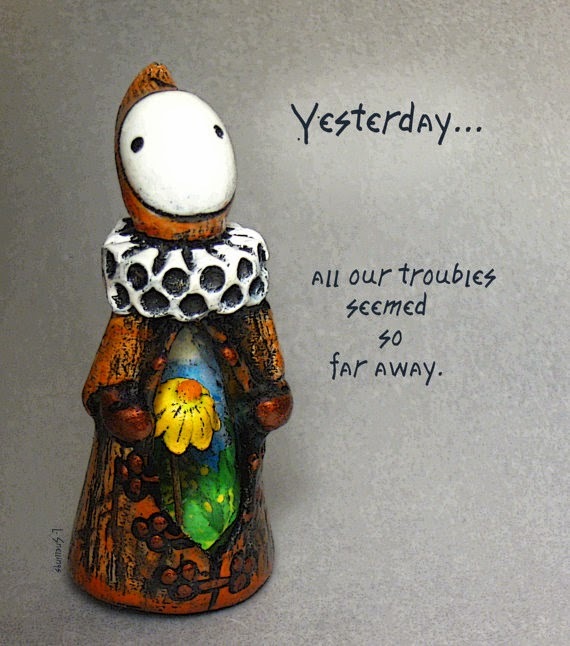 If this was the first poppet made in a series of poppets to be made, or a one of a kind, we'd now take it for photographing, work up some ad copy, list it on Etsy and promote it via Facebook and mailings. But since this is a poppet that you ordered, your pal Jessie here will put together your brilliant little package. You know the one! The one with all of the ribbons and bubble wrap and "scraggle" (which is what I call the shredded paper accordion stuff) and pretty little gifts and a thank you card. -Lisa prints those little art cards, one of us uses spray glue to back them onto cardboard and then cuts them out. -I put in orders for your little treats, like the pinback buttons. We aren't making those, another shop on Etsy does them for us. -Each package takes between 10-20 minutes to finish. So if you've ever wondered why shipping on a little two inch figurine is $5, it's because a human girl really did put in a bunch of effort to wow you and there's a lot of stuff in that box surrounding your little friend. Now I hope you understand why we sometimes fall behind at Poppet Planet even though Lisa is working until 10 or 11 at night every day of the week, and why correspondence starts off with "Hey there, this is Lisa's assistant Jessie." By all means, if you have questions, please send them. And by all means, if you have a gift to order please tell us so we can make your order a priority. Our shipping is not slow. Our production list is long, and our orders are backlogged. Contrary to popular belief, we do not have a stock room of hundreds of pre-made poppets we can just throw in a box and send out. Though we may have a few extras on hand from our "work smarter not harder" production technique, it took us time to make those too. And believe me, I may help out but the brunt of the work is done by her. Lisa and I thank you for your patience while we adjust to all of this growth. The majority of our customers have been super cool these past few months, and you've been extremely patient with me specifically while I learn. Thank you for not making Poppet tap and re-tap the sign.